The Catrike Boom Chain Tensioner allows riders of different heights to share the same trike. 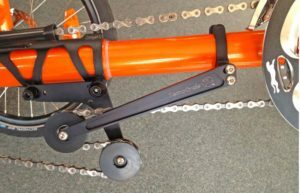 The Catrike Boom Adjust Chain Tensioner allows you to move your boom without hassling with the chain. It automatically compensates for changes in chain length when you adjust the seat for different riders. Perfect for anyone that would like to share their Catrike with different riders. The installation is simple, design is sleek and materials are strong. If more than one person rides your Catrike, then a Catrike Boom Adjust Chain Tensioner is perfect to eliminate the worries of whether the chain is too long or too short! Available at our shop in Northampton, MA.